Progress oftentimes occurs at such a painstakingly slow pace that it hardly seems that anything is advancing at all. For many young brands, including My Karuna, the journey up the hill to reach the altitude at which we can see our vision beginning to come to life is especially daunting and at times can seem demoralizing. If you have an excellent product or concept, however, and you trust your process of refining it, communicating it, and ultimately serving it to your customers' benefit, than stick to your gut and make sure to treat yourself with compassion by taking stock of all the little victories which add up day by day. For, in being mindful and counting the small building blocks as they accumulate, you will shift your attention away from the obstacles that may seem overwhelming when faced head on and you will begin—perhaps without even being aware of it—to woo the beginning of your dream together. With My Karuna, our infinitesimal steps towards tangible progress started with an idea. The idea was to develop a universally relevant and uplifting philosophy that we believed deeply in and could act as the guiding force for our future creations. By harmoniously blending ancient eastern wisdom for mindful wellness with the most advanced health formulas of modern science, we were able to produce a line of products that would detoxify, nourish, and energize all who enjoyed them. Then, by communicating our creations through a message of compassion, respect for others, and a mindfulness for how we could benefit the lives of those we touched, we were embraced enthusiastically and opened doors we never thought we could. Day by day, we counted these small victories until each seemed a bit bigger and a piece of something broader and more substantial. Then all the sudden at the beginning of 2018, we experienced our first wave of popular bloggers and lifestyle trendsetters in our native market of St. Louis—such as Kait Reichart and Mary Powers—reach out to us to try the brand and to start organically incorporate it into their lives and blogs. This slightly bigger step led to exposure of our brand across much of the St. Louis region and precipitated bigger celebrities such as Akon requesting to try our product. 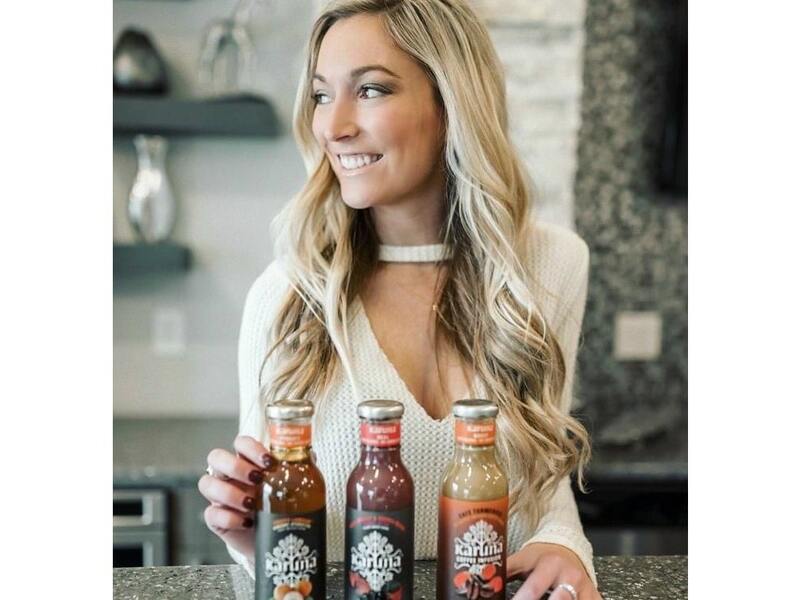 Leading St. Louis lifestyle blogger Kait Reichart touts My Karuna as her wellness beverage of choice. 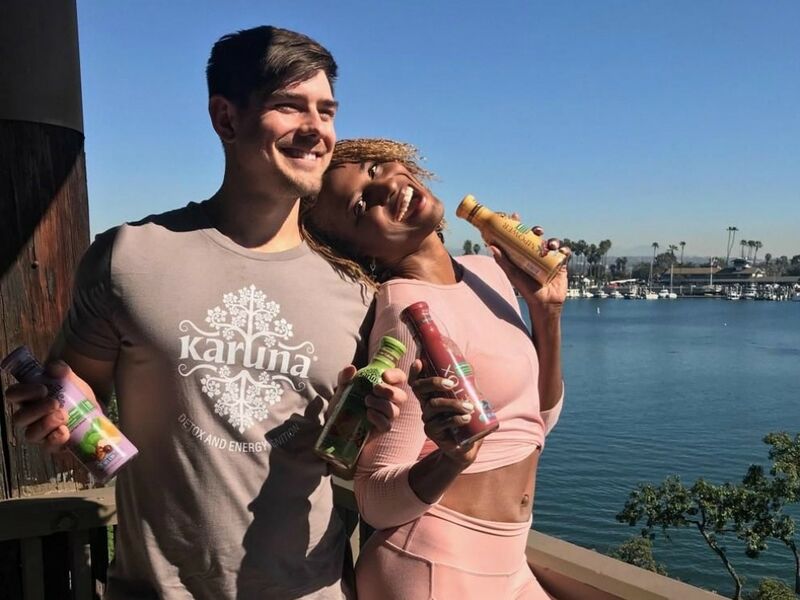 At the same time, our long term goal of launching My Karuna in Los Angeles started to slowly materialize by getting breakthrough initial meetings with stores that could support our expansion and by earning the interest of passionate Los Angeles advocates for the brand—including famous health and yoga coaches in LA such as Koya Webb and Samara Zelniker. Then just days ago, we received our official USDA Organic Certification for both Karuna products as well as our production facility. This certification, incidentally was a key accreditation we needed to have in order to pursue a full LA launch and it could not have come at a better time. At the same time, our long term goal of launching My Karuna in Los Angeles started to slowly materialize by getting initial meetings with stores that could both support our expansion and our mission. L.A. celebrity yoga coach Koya Webb showing her affection for My Karuna. While we have acknowledged and drawn inspiration from these individual victories, this last one (the USDA certification) was a large enough centerpiece to make us realize that much of our initial vision for My Karuna was in fact coming together. What started as an idea out of thin air was now flourishing into a national business with a proven product, passionate early adopter community, the right industry credentials and support, and we had finally climbed to a high enough altitude to view everything holistically. Like standing atop the summit of a steep mountain, the pain from the rigorous hike up is immediately forgotten and the joyous prospect of what lays ahead carries and delights the soul. This is the way we all deserve to feel and the good news is that it's completely within our grasp to feel this way. In learning from our analogy, it's important to bear in mind that no matter how difficult a challenge you face, if you can simply focus on taking small steps in the right direction, trust your process, and take a moment to pause and look at things holistically, you will be surprised at how fast your visions can come to fruition. With a consciousness turned towards progress and tightly shut to discouragement, you will make each day on your pathway more enjoyable and will empower your small victories to outshine and override the challenges, no matter how formidable they once appeared in the past. It's an important, even vital, part of a balanced approach to work and ensuring harmony between spirit and success.